Whew! It's taken almost two years but the dust has settled and I've just checked a big "to-do" off my list. 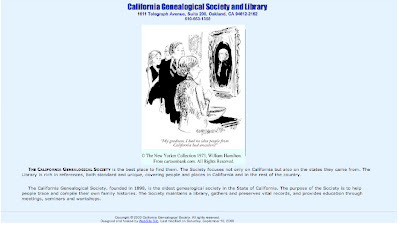 Welcome to the new and improved California Genealogical Society and Library blog. Do, please, let me know what you think! First, you should know that this is more than just a blog remodel. Our new look extends to all of the locations that the California Genealogical Society sponsors across the web. We've come a long way since 2000 when the society put up its first web page. I was able to find an image thanks to the wonders of the Wayback Machine. For many years it was our sole home on the net until things changed in 2007 when we published the first edition of the eNews and started the blog. With the addition of a Facebook Page in 2008 and Twitter in 2009, it became apparent that we needed to think about coordinating our look – to create a "brand" – to present a cohesive message to the world. 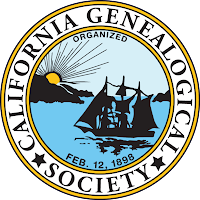 The one piece that has remained at the center of our look has been the seal of the California Genealogical Society. 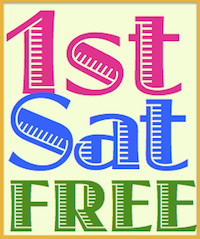 Who created it is lost to history but it was certainly commissioned under the auspices of the New Englanders who founded the society on February 12, 1898. Some call it a "logo" but our former recording secretary, Shirley Thomson, set me straight. It is a seal and the library is still in possession of the hand crimper that is used to emboss the image onto paper. The digital image has been cleaned up a bit as evidenced by this photo I took of the front page of The California Register, Vol. 1, No. 1, April 1900. As you can see, the original seal was quite a bit more detailed. It has been prominently used by the society since our earliest days. We had a couple of false starts with the "branding project" but things came together last July at a meeting of the Publication and Marketing Committee when Cathy Paris pushed us to think of a "nickname" for the society. She was concerned that our domain name, calgensoc.org, was difficult to remember and in a brilliant, collaborative session CaliforniaAncestors.org was born. 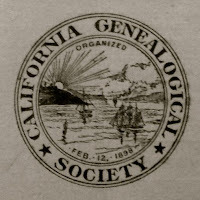 It is fitting that 112 years after its founding, the California Genealogical Society is once again following the lead of the New England Historic Genealogical Society which has been using NewEnglandAncestors.org for several years. The Website Committee, under the leadership of Kathy Watson and the technical skills of Larry Youngman, took care of all the details and coding involved in switching to a new domain and changing the masthead and colors at the website. Cathy Paris created a mock-up of a banner and we turned things over to our wonderful graphics volunteer, Lois Elling. Lois works for CGS behind the scenes but her work is everywhere. She is the production editor for The California Nugget and it was she who created the cover for our magazine. Lois's first clever idea was to use that old Ted Turner trick and add color to the seal. So now you know the backstory of our new look. We aren't Coke™ or Nike™ so there won't be any Superbowl ads. We did this on a shoestring budget thanks to an army of society volunteers. And we are putting our best face forward in time for what we hope will be a surge in interest in genealogy with the premier of Faces of America on February 10 (PBS) and Who Do You Think You Are? (NBC) on March 5, 2010. It's fabulous! What a fantastic job was done to create the new visual image of CGS. Love the new masthead -- the colors, the graphic design. The new website name is a great idea, much more memorable. Great job, everyone! Thank you very much. That is high praise coming from you! There's lots of excitement up here already about Jamboree. See you in June. Thanks very much for the positive feedback! We have the best volunteers in the world and they do deserve high praise. Bravo! Makes me proud to be a member! Fantastic, well done, super AND Kathryn you are too modest about your role in making it happen...you, too, deserve a pat on the back as well as the many volunteers named! Ah, shucks, Jeff, thanks for the pat on the back! I hope you read the previous article. Thank YOU for joining the board of directors. Wonderful new site! Great job! Congrats to all who participated! Congrats Kathryn! Great new look...I really like it! Super new look --- easy on the eyes too. Thanks for inspiring us all to "clean up our acts" too. I think the new branding looks fantastic! I love the yellow and blue together. As outgoing president, I am continually amazed at the talent we have in our society! Kathryn and our graphics guru, Lois Elling, are to be commended for pursuing this project in such a professional way. The new look continues beyond the internet to the revitalization of our periodical, The California Nugget. Now it is going to be so much easier to communicate our web address – CalGenSoc.org was such a stumbling block. CaliforniaAncestors.org can be said ONCE and people get it! Thanks!